They are expensive and inefficient. Solar panels need to develop a lot before they can provide the average man on the street with enough energy to supplement a worthwhile portion of his energy intake. Mind you, the average man is pretty inefficient. Cars, lighting, heating, cooling. We sap up energy like there’s no need to think about tomorrow. I’m sure the average person could cut their energy usage by 90% if they had the skills, time, money and resources to do it. At that point, solar power might be a more interesting proposition. Mobile computing is one of the areas that is already cutting its energy requirements buy huge amounts. Where notebook PCs can take 20-30W, ultra mobile PCs are taking 10W and in 2008 when we start to see dedicated ultra low power, ultra mobile computing devices, that power requirement is going to get slashed down to the sub 5W level. Intel is talking about sub 4W and VIA have just launched the 3.5W Mobile-ITX board. Of course, the reason for this is not because of energy conservation, its because of heat, size and weight. Mobile devices need to be small and light. Small devices can only dissipate a certain amount of heat and light devices can only contain a certain amount of battery. The last thing we want is a UMPC melting through the bottom of our bag! One nice side-effect of all this drive for tiny, light devices is that solar energy starts to cash-in. 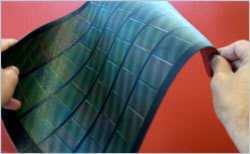 Smaller energy requirements means smaller solar panels which means lower costs and higher mobility. Right now, today, if you took the best solar technology and made a fold-out sun-shade for a UMPC of about 20x20cm, you would be able to power the UMPC non-stop during sunshine. Its true. The best solar tech is reaching 40% efficiency in the lab and at that rate a 20x20cm panel would provide up to 40W of power. Unfortunately, this is lab-tech at the moment and good quality, mass produced solar panels are down at the 15% efficiency level. Also add in the fact that many places don’t get much sun and you can see why its not really possible today. But lets take the Reware Juice Bag as a good example of a useable bit of solar tech. 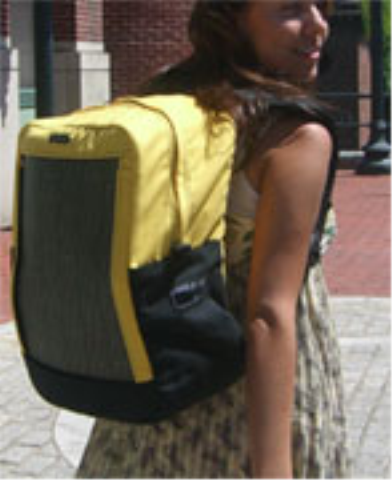 It can provide up to 7W of power from a 20x30cm panel stitched into the backpack. That’s about 25W of stored energy per sunny day if you take into account losses on storage. Today, that would give you about 2-3 hours UMPC usage but with a 5W UMPC, you’re looking at 5 hours usage. Drop down to 3W (2010 perhaps) and 8 hours of battery life starts to get really useful. Lets assume that by 2010 the efficiency of Solar panels in increased by 50% and you’ve got full-day power from a panel that’s the size of a UMPC. OK, its not 100% practical for everyone to be sitting outside looking for sun but it would work for a lot of people. And its just one example. How about taking the same calculation and scaling it up to a classroom full of UMPCs. You could power a full class of 30 with a few square meters of solar panel. Costs would be sub $1000 and if you compare it to 30 normal PC’s taking 150W per hour for 4 hours per day. (30 x 150 x 5 = 1.8KW) you are not only helping the environment but you’re reducing your air-con costs, noise and starting to get to the point where you save significant amounts of money. For a university that has 2000 PC’s deployed, well I don’t need to show the calculation do I. After the solar-ump tour is finished I’m going to be following solar tech very closely on this blog and will continue to promote the marriage of ultra mobile PCs and solar tech. I don’t see the battery companies shifting towards more efficient battery technology so as solar energy starts to become a really interesting business opportunity we might start to see solar being integrated into specialist UMPCs for long-term outdoor usage. At some point in the future, when the calculations look attractive to the bean counters of this world, investment money will come pouring in to the mass market and the whole thing could take off in a very short time span. I predict, with excitement, that within 2 years we’re going to see solar accessories for UMPCs. Within 3 years we’ll see specialist UMPCs with integrated solar panels. I’m hoping that in ten years time, the extended battery will be a thing of the past.